Test your skill at guessing the meaning of the architectural elements shown at the end of the post. Our project, the OCU School of law, is being retrofitted into an historic structure built in 1909. It was originally designed as the first high school in Oklahoma City and was named Oklahoma High School. It was designed by Solomon Andrew Layton during a period of architecture that was infatuated with classical revivalism. 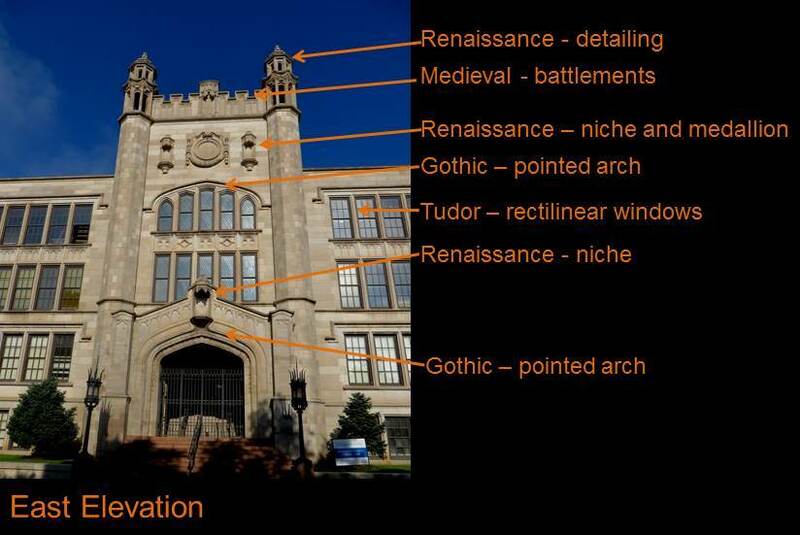 Popular Classic styles for replication included Greek, roman, gothic and renaissance (mainly Italian). For some reason bringing back Romanesque never caught on. Our building has been referred to on occasion as “Collegiate Gothic.” But what does that mean; collegiate meaning academic, a place of learning, or just a popular style used on higher learning institutions? Gothic is more straight forward as it represents a classic style, however, there were many sub-styles over the period that it existed between the 12th and 16th centuries. I could easily tag it as “Plains Tudor” with equal justification. What you really find is that gothic revivalism was a kitchen sink of stylistic elements put together with some sense of articulated order. I believe that our building is a pleasant assembly of motifs resulting in a lasting design solution. 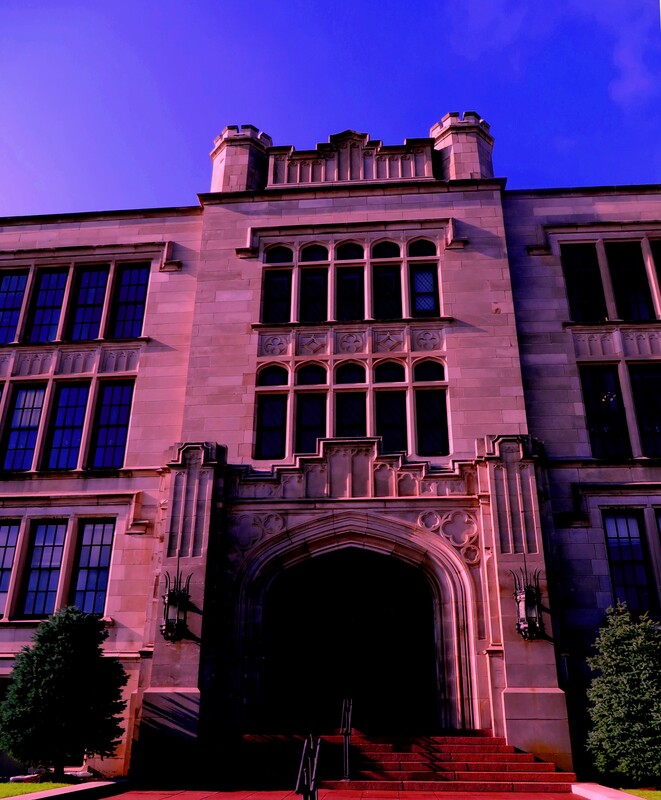 For me, the Oklahoma High School is a combination of predominantly English Gothic with some English Medieval and English Renaissance thrown in. The sequence of English architectural styles is roughly; Medieval (all that castle stuff), Gothic broken down as, perpendicular and Tudor, and then early, high and late Victorian, followed by Renaissance which brings us to about the 18th century. In the 19th and 20th centuries British architecture became a battle between Classic and Gothic revivalist styles. The whole revivalism period was influenced by the Ecole des Beaux Arts in Paris (School of Fine Arts) and spanned in popularity between 1860 and1930. The American Gothic and Renaissance revival occurred during this same period which is where our building falls. The single defining element that signaled and differentiated the Gothic period of style was the pointed arch. After that, other elements crept in like the very rectilinear Tudor windows. 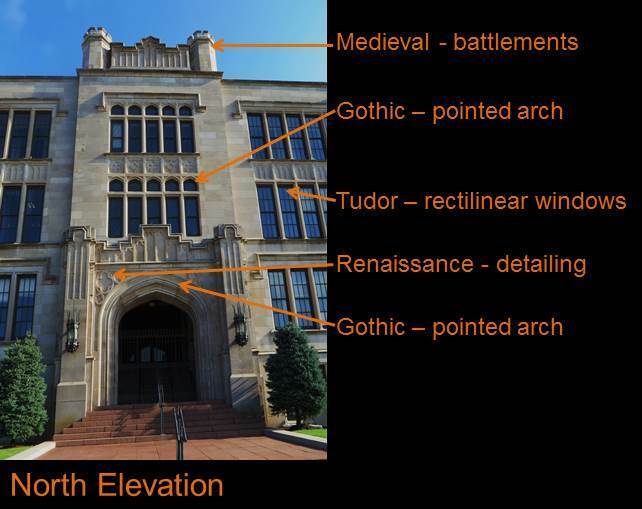 Here are all the architectural parts I see on our building: Medieval (battlements), Gothic (pointed arches), Tudor (rectilinear groups if windows), Renaissance (rounded parapet elements, niches and medallion with scroll work). There is a series of other elements that are not necessarily from a period but are distinctive and telling of what the building was originally designed for. The elements are in the shape if a crest and there are 2 on each of the 4 sides of the building. 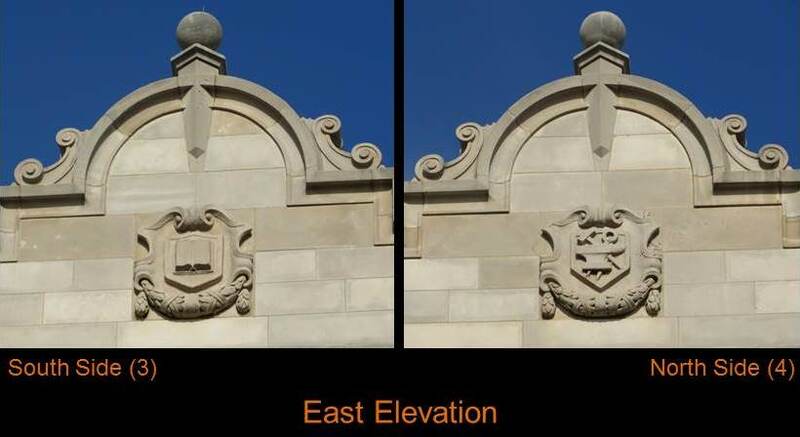 How do these crests relate to the building? What is the story behind each crest? Is their location on the building relevant to where spaces are inside the building (to explore this notion click “here” to see the original plans for Oklahoma High School; North is to the right on the floor plans)? Here are the 8 crests and their locations on the building. Take a shot at guessing their relevance and place your answers in a comment to this post. Check back to see what other followers think of their meaning. 1. World history, geography 2. Math 3. Literature 4. Trades; shop 5. Biological Science 6. Home Ec. 7. Art 8. Music. I think the east represents the beginning. The beginning of the learning experience is reading and math, two different branches that become the tools for all the rest. The history and geography show us where we are and where we have been, a valuable lesson in avoiding the making of identical mistakes. All the rest is learning to live and contribute in a world thinking only of itself.